Along with the lettering/calligraphy practice and all the playing with yarn, I’ve been turning my hand again to illustration and drawing. 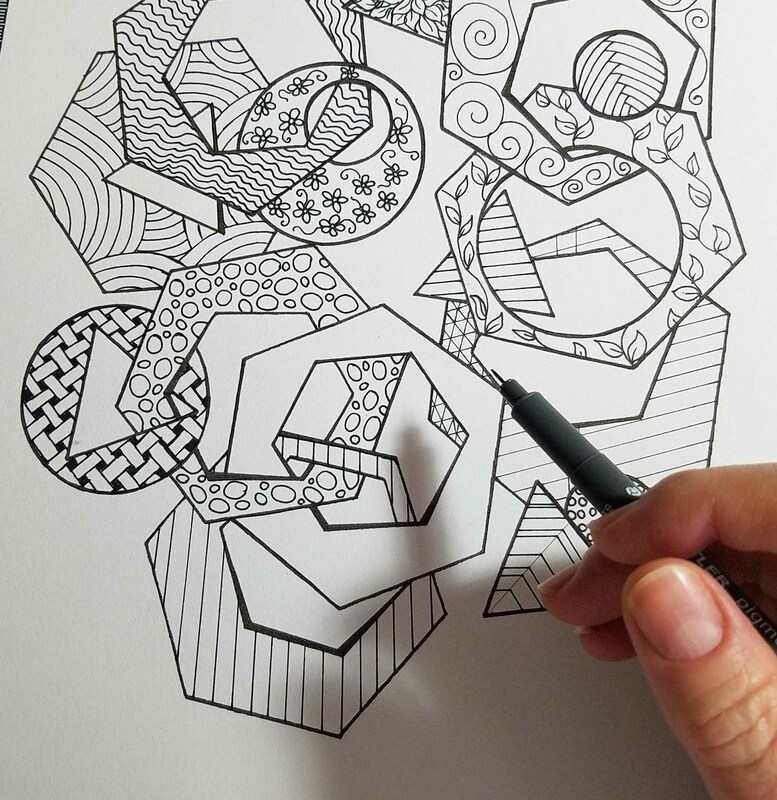 When the coloring book craze first started off I kept thinking, “I could draw those.” I’ve always drawn and doodled. According to my parents, since I was old enough to hold onto anything to make marks with. I gathered up my paper and drawing implements and began doodling some ideas. 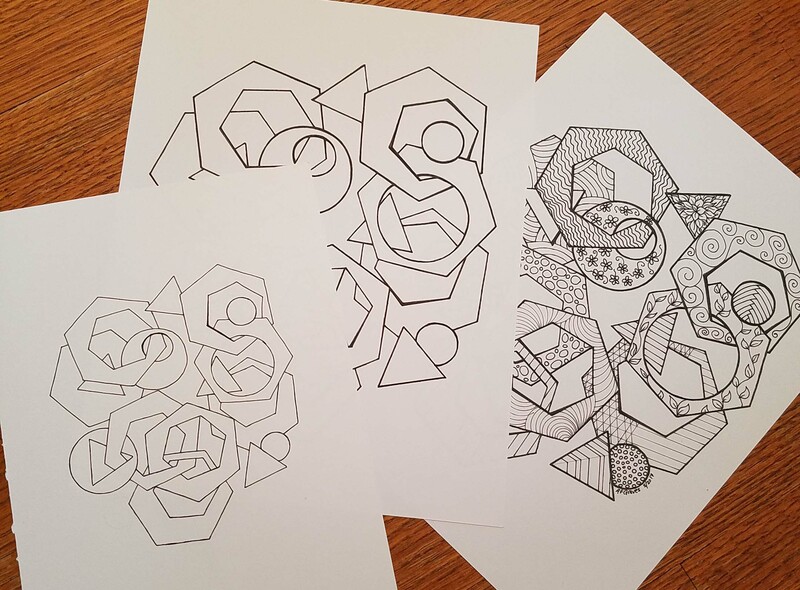 I’ve always loved using templates to create basic shapes then filling in the shapes with lines or organic shapes. 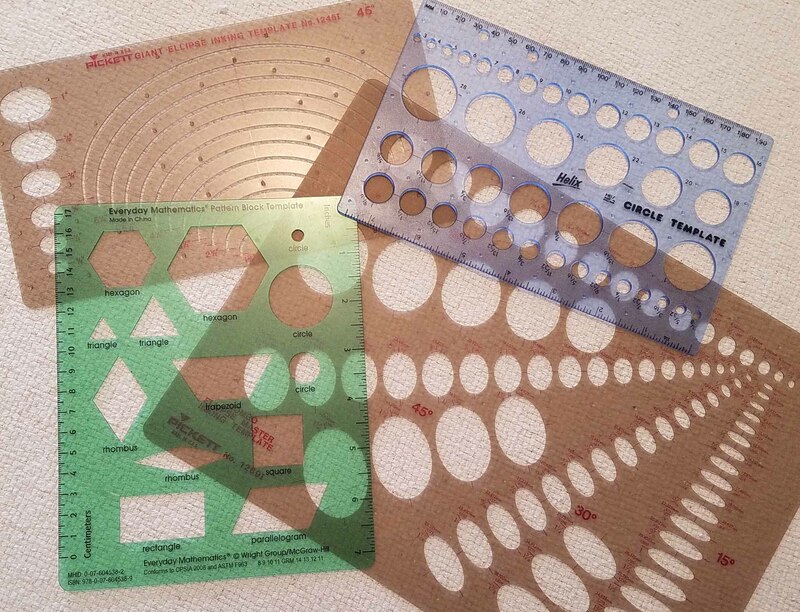 I purchased many of these templates during my college days when I was taking graphic arts classes. You can find similar templates thru art and hobby supply shops. I recommend using a nice heavy weight printer paper. If you are going to be coloring with pencils, look for a paper that has a bit of “tooth” to it. 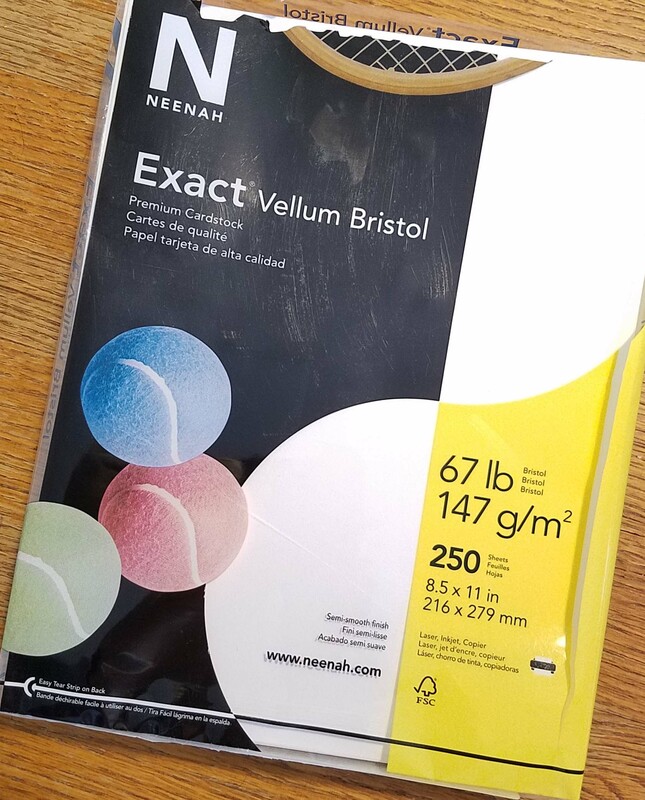 I purchased this ream of Neenah “Exact Vellum Bristol” a few months back and have been very happy with it. It is great for dry media like colored pencils, crayons, pastels and ball-point pens. I haven’t tried any of my color markers with it yet. My pigment illustration pens work well with it too, as long as I don’t let the pen point sit on the paper surface too long. These pens are quickly becoming my favorites for final drawings. 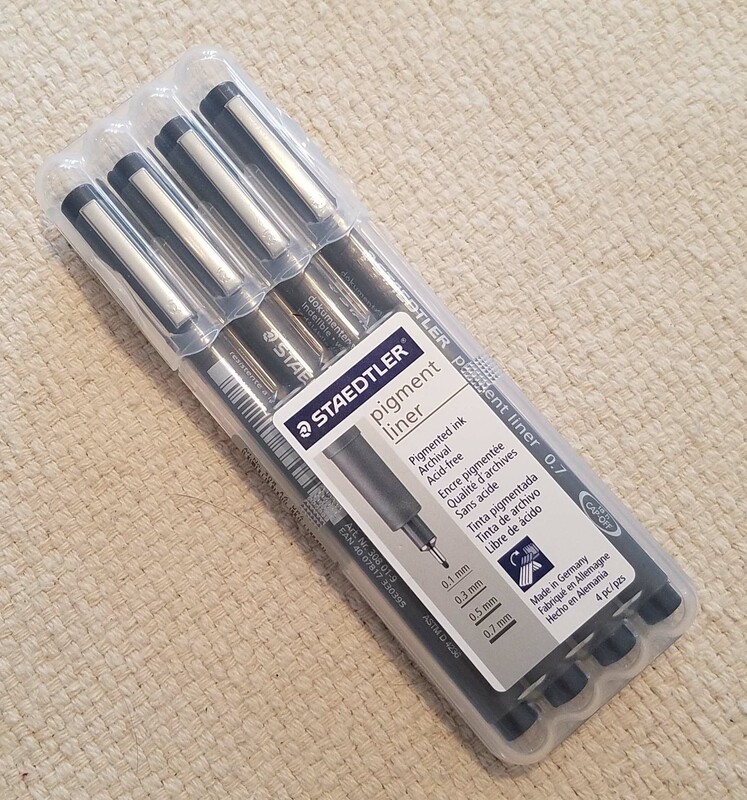 The variety of nib widths give me a number of options for thickness of lines and the ink supply is generous. For this first drawing I drew a pencil sketch using my templates, then drew over the pencil drawing with my black ink freehand. A few of my lines came out a bit thicker than I wanted, but I wasn’t too concerned. I then scanned the drawing into my computer and used my graphics program to clean it up a bit. I printed it out on some of the cardstock and refined it with the pens, adding thickness to some of the other lines to balance out the original heavy lines. I then copied this refined drawing on the heavy cardstock. I made a number of copies so I can try various “fill” drawings for the shapes. The drawing in the PDF is just my first try. For those of my followers whose focus is on crochet and yarn crafts, don’t worry, I’m still designing and creating lots of fun crochet patterns. If all goes well the next month I’ll have a lot of exciting crochet designs and videos to show you very soon. Thank you!!!! 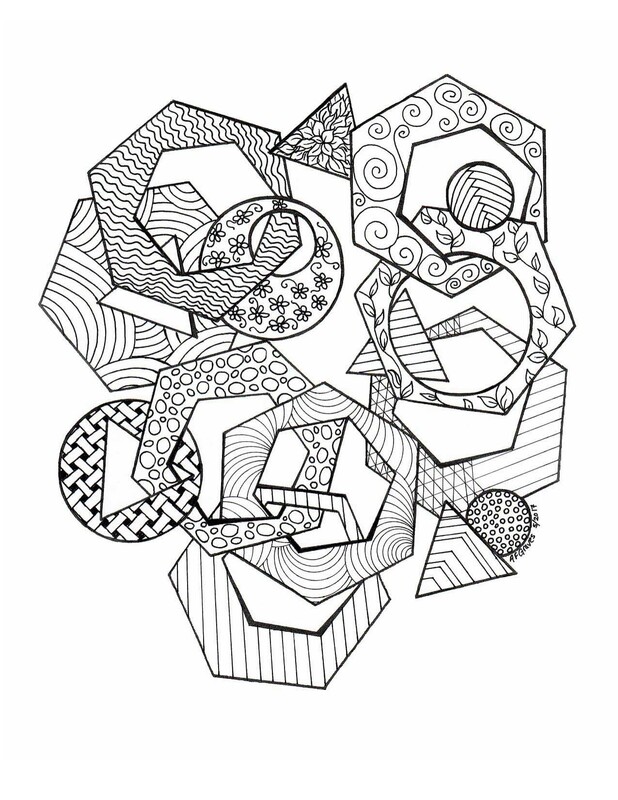 =) Love the geometric shapes with the different designs within and then all the connections!!!!! A little M. C. Escher going on, one of my faves!!! !